The new skua repeatedly dive-bombed the other before finally collecting the dead penguin and flying off, the finale captured by luck in the shot below. The harsh reality of life in the wilds, luckily caught on film…..
Take a moment to view other Antarctica photos here. how did the penguins and skuas become enimies is it because the skua trys and eats the baby or is it because the penguin trys to take the baby away and adopt it and do skuas actually eat the adult penguins to? hope to here your reply thanks zoe win from golden bay high school. Hi Zoe. Thanks for the question. 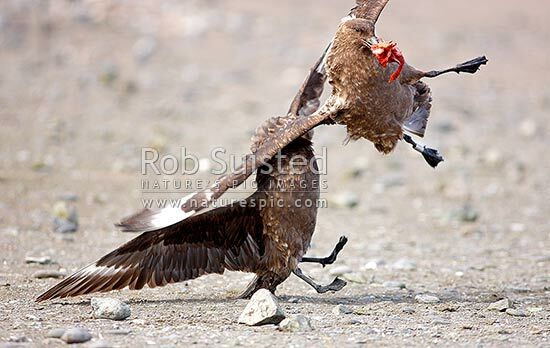 Penguins don’t like Skuas because Skua birds attack their nests trying to eat the penguin eggs, or small chicks. Skuas of course love penguins because they’re food for them to be able to raise their own Skua babies back in their nests. The reality of nature – everything is connected, but sometimes not very nice to watch. You're reading Poor baby penguin – realites of life in the freezer… at Nature’s Pic Images Blog.